On the hunt for serious space (and a place to park your car) in the East Village? This roomy condo, now on the rental market for $15,950/month, might do the trick. The 2,400-square-foot duplex apartment is located at 211 East 2nd Street, an eight-unit development known as the Carriage House. Besides all that space, the apartment also boasts 14-foot wooden beamed ceilings, a private patio and your own private indoor parking garage. From beats like Allen Ginsberg to ’80s artists like Keith Haring, the East Village was once home to the city’s hippest New York icons (and, some may argue, still is). 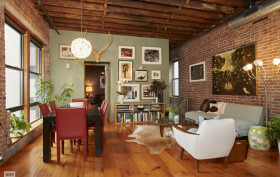 But since its heyday, the neighborhood has become an extremely sought after part of the city, and this East Village pad that was recently put on the market is fully stacked in the hipness department. 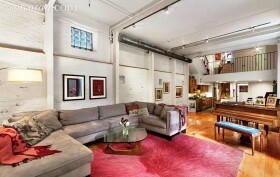 The four-bedroom unit is located at 211 East 2nd Street and is currently listed for $2,695,000. From the Carriage House condominium’s unique exterior to the edgy, rustic interior, this home is sure to make you the coolest kid on the block.